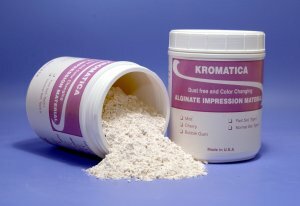 Kromatica comes in fast set or normal set, and in flavors cherry, mint, bubble-gum, and a non-flavored alginate. You can purchase a 10lb case of ten 1lb aluminum foil pouches and 1 empty can, twelve 1lb containers, a 20lb box of twenty 1lb aluminum foil pouches and 1 empty can or 50lb bulk. Minimum body flow and short duration in the mouth for maximum patient comfort. Meets American Dental Association Spec. 18 and ISO 1563.